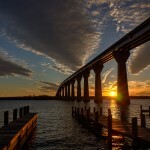 Solomon’s Island in Calvert County Maryland is a cool place to hang out for sunset. If it’s a good sunset I’m never alone – lots of cell phones are catching the moment. © 2019 Before The Coffee|ProPhoto Photographer Blog by NetRivet, Inc.